Two Swallows: Which is Which? 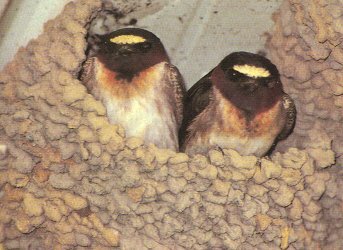 Two different species of swallows nest on buildings, bridges, and other human structures, constructing their nests from mouthfuls of mud, Cliff Swallows and Barn Swallows. Which is which? 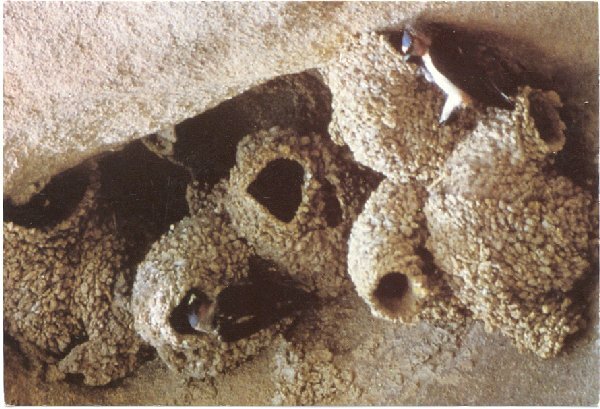 Cliff Swallows (the "Swallows of Capistrano") nest in colonies, with nests often touching each other. Each individual nest looks like a gourd, with a small hole serving as the entrance. 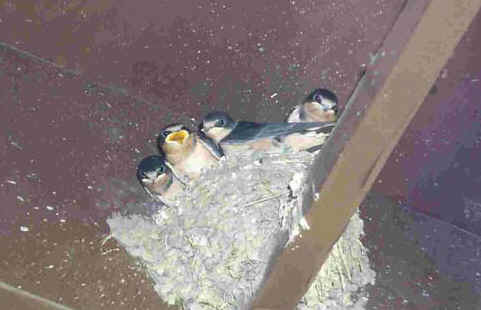 Cliff Swallows often nest below eaves, the mud plastering the nest from behind and above. Notice the tiny entrances to these nests, and how close they are. Barn Swallows nest individually, though nests can be fairly close to each other. On the outside each nest looks deep, but is mostly mud through and through. The actual nest is a shallow cup. Try This! Which Is Which? Look up swallows in a field guide to birds. 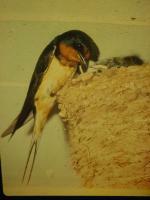 Compare the Barn Swallow and Cliff Swallow. Then check off which goes where on this table. Some features may be found in BOTH species. Make sure you look at both adult and immature birds.